Police recovers N27million from Festac bank robbers. 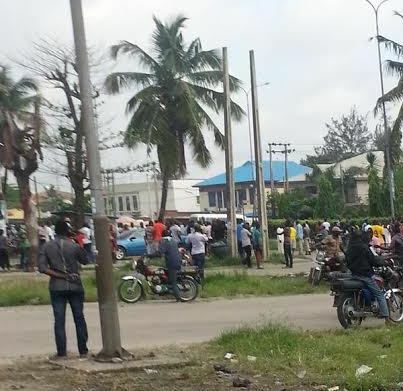 This is an update on the Festac robbery early today. Hours after the armed robbery gang numbering over 40 stormed both Diamond and Access Banks at 4th Avenue, Festac Town, Lagos, the Area E Command have released some exclusive details. Below is a statement from the police..
Today 13/10/2015 at about 0825hrs the Area ‘E’ and the Divisional Police Headquarters both at Festac Town received information of sporadic shootings at 4th Avenue Festac Town, Lagos. In a swift reaction, the Area Commander, Area ‘E’ mobilized a joint Team of Area ‘E’ and Divisional Headquarters, Festac that engaged the Armed robbers numbering over 40, dressed in military Camouflage and armed with military assault rifles of various calibre robbing Access and Diamond Banks simultaneously. The gun battle forced the armed robbers to abandon over Twenty Seven Million Naira and Two Hundred and Forty Rounds (240) of 7.62mm live ammunition. No life was lost on both sides. The case has been referred to Special Anti-Robbery Squad for discreet investigation while security has been beefed up within Festac Town and its environs. The Commissioner of Police, Lagos State wishes to reassure the residents of Lagos of their safety and urge them to go about their normal business as he has vowed to stop at nothing in unraveling the perpetrators of this heinous crime.